Phyllis Diller hair. Bold, brilliant colours. They fly low and long, in a single row. Diving ducks give bird watchers a show on the Bow. Birders, alert: this a great time to find loon-like diving ducks on the Bow River, naturalist Brian Keating told Homestretch host Doug Dirks this week. Q: Where are the ducks diving? A: This is prime time to find mergansers, which are loon-like diving ducks that are on our river through the city right now. In fact, two weeks ago when I was standing on the Peace Bridge, watching those brown trout do their thing in the water — building their beds for laying their eggs — I noticed two mergansers were working their way upstream. They were diving right down below us, so we could see them as they were swimming underwater. It's fascinating, to get a bird's eye view of a diving duck looking straight down through clear water, seeing how their feet are located so far back on their bodies and how they manoeuvre around. A: They've got a long red bill, narrow red bill — a serrated bill, if you get close enough to look at — which readily distinguishes the merganser from all the other ducks. The legs and feet are also a deep red in colour. The males are big — up to about 1.5 kilograms (3.5 pounds) in size, so they're among the largest ducks. They're quite a bit less stocky than the other one you might confuse it with, which is the goldeneye on the river. When they fly, they look elongated — almost like they've been stretched — and they fly in long trailing lines. If there's a number of them flying together, they'll fly one after the other and usually low over the water. Right now, the males have a beautiful greenish-black crest on their black head, on their upper neck, and below that, a creamy white underside, and they've got black backs, so they're very boldly coloured. When you see them on the river, you can't mistake them for anything else. The females have a red tufted head — in fact, it looks like they have a Phyllis Diller hairdo. Their hair is swept straight back. Just imagine heading into the wind at high speeds and all the hair going straight back. Q: Why is this a good time to see them? A: They're migrating through. I suspect a lot of their areas are freezing up with that cold spell we had last week, so they're coming in, and our Bow River is excellent for good fish, and these guys are professional fish catchers. They don't eat just fish, but they also go after crustaceans. Also, they're at their greatest number right now. They average about 12 eggs per clutch and they've actually found up to 17 eggs in a nest. And it's not unusual to see 20 or 30 babies following one female, because [their perspective is] as long as that bird looks like mom, I'm going to hang out with her. I don't care if she's my real mom. The female doesn't feed the babies. She just leads them from one good feeding place to another. Only two days after they're born, baby mergansers are already capable of diving. For the first 12 days of their life, they're after insects — and then they turn onto fish. Q: Where do they nest? A: They actually find old woodpecker holes, or natural large cavities in trees — so in association with old growth forests. They're a northern bird. You find them throughout the boreal forest, in those clean lakes up there and even, of course, right here along the Bow River, but because of the rarity of these holes, sometimes they have to nest a long way away from water, and sometimes, up to 30 metres up above the ground. 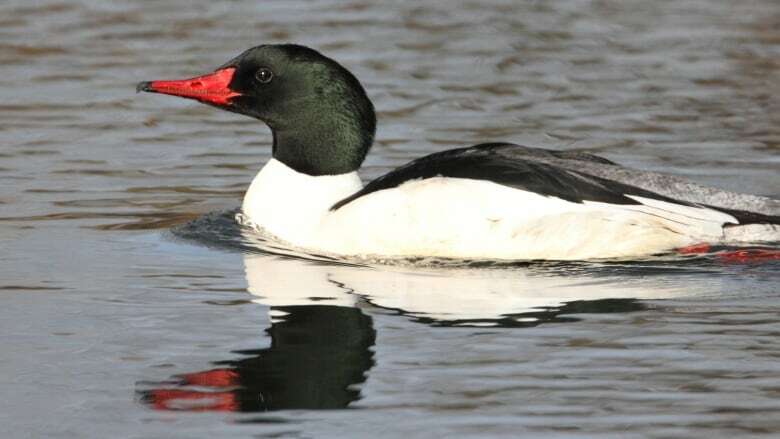 Q: Is the common merganser the only kind spotted in Calgary? A: No, we've got three species in North America and all of them are found in Alberta. I've seen all three in Alberta. Just this past spring, I was down at Frank Lake and saw a hooded merganser, which is a much smaller merganser but is stunning, actually, with its big white crest and its oversized head — and it does a wonderful little mating dance when its courting the females. And then there's the red-breasted merganser, which is actually the furthest northern nesting merganser, just south of the tundra landscape in the boreal forest. And then of course there's the common merganser. Q: Do they sound like a duck? A: Maybe a mallard with a head cold. Not really very duck-like. They're usually quiet out and there being pretty— and when you look as good as a merganser, you don't have to quack.